It was Jules Verne who wrote “Twenty Thousand Leagues Under the Sea,” which inspired Irwin Allen’s “Voyage to the Bottom of the Sea,” for which I unabashedly spoof. However, this is no laughing matter and we’re not talking about the bottom of the ocean here, we’re talking about the ocean that is our economy and our markets. You don’t want to be at the bottom of the saltwater sea (improperly equipped), and once you know what’s coming, you won’t want to be at the bottom of the market ‘C’, either. According to Elliot Wave theory, bear markets unfold in an A-B-C manner. Wave A goes down, wave B goes up/sideways, and then wave C declines into the eventual bottom. Do I need to draw a picture with my crayon? Okay, it’s worth knowing because every bear market in the history of the United States has unfolded in such a manner. Each wave is made up of progressively smaller waves that can be counted in a similar manner. I would contend that not only do bear markets unfold in this manner, but the backsides of all parabolic curves unfold in a similar manner. Thus, we are all on a voyage to the bottom of the ‘C’. This voyage is a fantasy spectacular, invented by central bankers who turned THEIR game of money into OUR voyage. The game is being played by children, but it has gotten WAY, WAY out of hand. In my house, when the children’s play gets out of hand, I go over and end the game. That’s what ADULTS do, especially if the children are playing with matches that threaten to burn the house down. Just look at the devastation found in wave A already: The entire investment banking industry wiped out, the automobile industry in ruins, hundreds of thousands unemployed, trillions lost in the real estate and stock markets, retirements in ruin, and people’s futures in question. While I write in fun and provided a pretty Elliott wave diagram, it does not reflect the devastation on REAL PEOPLE and their lives. If wave A can do all this, think about the real consequences of arriving at the bottom of the ‘C’. My own research shows that similar credit contractions that are on the next LOWER DEGREE take approximately two and a half years to run their course in the equity markets as seen by the length of time from the top to the bottom during the Great Depression, the crash of the Nikkei index in Japan beginning in 1990, and the crash of our own NASDAQ in the year 2000. This voyage’s Wave A began in October 2007 and ended this November, slightly more than a year. The experts believe Wave B should last two to four months, then comes Wave C. If symmetry prevails, Wave C will be of similar duration to wave A. That puts the bottom of C right in the same 2.5 year relationship which would be approximately April, 2010. And that’s just equities. Real estate will take longer, and remember that this is a grand supercycle correction that may take longer still. The children are debating weather this voyage ends in a “V”, a “U”, or an “L” shaped bottom. Yes, we can HOPE for a “V”, but my opinion is that IF the game continues in its present form, the best we can hope for is an “L” whose bottom is measured in years, if not decades. Now, if you are a “child,” this probably doesn’t concern you, ignore it. It’s just doom & gloom talk and serves no useful purpose, right? After all, “dad” has come in and said that he’ll do anything to keep the game going! Well, from my perspective, the “dad” in reference are all figures who are also living a fantasy. They are all children playing a game while the house is on fire. The smoke detectors are blaring yet NO ONE has yet to get on the phone and dial 9-1-1. Not in the real world anyway. The real world is where adults understand the rules of math, physics, and economics. In the real world if an adult has a teenager who is spending money on credit without sufficient income, they cut the credit off and tell the teenager to get a job. In the fantasy world, they tell the teenager to spend, spend, spend, and don’t worry, you can work later. And that’s exactly why we’re all on the voyage to the bottom of ‘C’! Like it, or not, you’re along for the ride. Want it to end? It’s simply, really, if you can think like an adult. You see, like all games, the game of money was invented by people. People can choose not to play the game. They could also choose to change the rules to the game, OR they might try to invent a different, better, longer lasting game. Those are the choices. Do you see another, or are you a child who believes that this game can continue even though the math says it can’t? Well, sorry, it can’t: http://economicedge.blogspot.com/2008_11_23_archive.html. Wave B, RIGHT NOW, is the time to have a rational, adult conversation about the game of money. Wave A culminated in FEAR and HIGH EMOTION which is now subsiding. Oh, we’re going there again, but that’s NOT the time to hold discussions. If we wait until the climax of fear to begin REAL DISCUSSIONS about the roots of the problems (the GAME), then the game masters (central bankers) will use that fear and occasion to spring their NEW GAME upon the children. And we all know what kind of decisions EMOTIONAL CHILDREN can make! I contend that any new game presented by central bankers will be similar in manner to the old game in which a piece of every transaction, made in any manner, goes to them. Why would the PEOPLE want a money system where a piece of the fruits of their labors always goes to the central bankers? Is that what our founders envisioned? 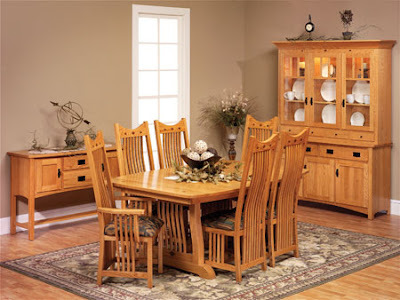 I say not: http://economicedge.blogspot.com/2008/12/my-money-tis-to-me-sweet-land-of_02.html. When you and I decide to exchange the fruits of our labors, the money transaction should be neutral. This country’s money BELONGS TO THE PEOPLE, not the central bankers. Everyone I see is still talking about the trees… The adults want to CUT THE CRAP. They want the bailouts to end and they want transparency forced upon the banks. That’s great, but the reason transparency is not being forced upon the banks is that the MATH NO LONGER WORKS. This act would immediately kill almost all the big banks (and much, much more) as they have leveraged themselves up to the end of the parabolic curve. That’s why the current “adult” conversations are falling upon deaf ears. The politicians belong to the central bankers and our entire nation has become by the corporation, for the corporation. We can no longer talk about the trees in the forest because all the roots are rotten. That’s when I knew it was time to revisit my “fundamentals.” I taught people how to fly during my entire 26+ year flying career... I have run training and evaluation programs and from that experience I have learned that viewing a mistake is easy, understanding the root cause or the fundamental reason why the mistake was made to begin with is much more difficult. Being a trained accident investigator taught me that identifying the root causes is important so that the accident will not be repeated. In the case of a poor landing, I remind myself to lift my eyes and look dowwwwn the runway, not at the asphalt or concrete rushing up to meet my wheels! Yes, it is the SOFT LANDING that we all are looking for, yet we now know that was just hope, it did not happen. Thus a return to the fundamentals is warranted. Let’s face facts... The math no longer works; we are on the voyage to the bottom of the ‘C’ and at this point it cannot be stopped. While you are told to spend and spend, our government goes deeper and deeper into debt. The actions of piling more debt upon debt actually speeds the destruction, the exact opposite result you are told to expect. …when it is just a wreck, what are we to do? When my daughter (who is about to graduate from college) was a new teenaged driver, she was involved in an accident (that she obviously didn’t see coming), and the car was extensively damaged, much like our economy. I could see that it was clearly totaled, but my daughter did not understand how that “little” damage could total her means of mobility and independence. So I played along and we got an estimate from the repair shop. As the shop began to detail the expenses, the nice man started with a figure that was half the book value of the car and started adding up all the “other” expenses. When he got about $2,000 ABOVE the book value of the car, the MATH was speaking in the same manner as the math in our economy is now. “No need to keep adding,” she realized. It was TIME FOR A NEW PLAN. The accident in our economy has already happened, did you see it coming? The MATH is speaking loud and clear – http://economicedge.blogspot.com/2008/11/death-by-numbers.html. Is this accident over? Did it involve you? The damage all adds up to considerably more than $300,000 per person in the United States. Head a family of four? YOU are responsible for your share of more than $1.2 million of debt and obligations. Do YOU have it? The real question, of course, is can the efforts of our aggregate labors reasonably be expected to pay these massive debts back? Are tax cuts going to help that situation? Does spending more on BIG GOVERNMENT help that situation? Uh huh, that two year old can see the forest clearly while those on CNBC, and in Washington D.C., are staring at trees. There is a saying that probably has its roots in parabolic curves, and it goes like this; “Things that can’t go on forever, don’t!” Can you say, “Military industrial complex?” Remember all those parabolic debt curves, what happens when that parabolic growth ends? The good Dr. Bartlett knows math! He understands and clearly explains the exponential function that creates parabolas and what ultimately happens to all of them! Are you picturing those debt graphs in your head? How about our stock market? Evidently those guys didn’t study history before 1929, for if they did, they might have seen what Martin Armstrong describes as the 224 year Cycle of Political Change. He has traced that cycle back many centuries, describing the rise and fall (or major political upheavals) going all the way back to the Roman Empire… And when you come forward from that time, guess where it lands? Well, what year was our Declaration of Independence signed? Oh, that’s right, it was signed in the year 1776 and when you add 224 years to that you wind up at the year 2,000! “…Primary wave B should provide a powerful rally, and then Primary wave C should unfold in another series of abc's into the final bear market low. Typically the C wave of any bear market is more devastating than the A wave. Please keep this in mind during the Primary wave B phase of the bear market. 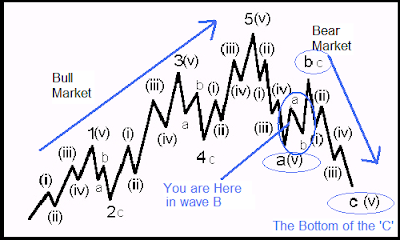 B wave rallies during bear markets are often mistaken for new bull markets. This mistake often lures investors into buying into the rally rather than selling. Remember we're only about halfway through the recession. Now, I don’t mean to just pile on here, but all the experts I follow are beginning to get on the same page. I’m NOT cherry picking for this article, these are the advisors who I have followed for a considerable length of time – they are the ones who have been most correct. Mind you these are not people who are negative by nature, they are responding to what they see, they are the true experts, not the media “yes” men. Like me, these people were at one time bullish on the markets and could see them going higher. Sure, they saw the debts beginning to mount, but most people did not see the parabola and did not understand the ramifications. The italics and bolding are his. This is a man who usually let’s the charts do the talking for him – unlike me! Again, this situation is not something to cheer about. It saddens me greatly and I am bringing it to your attention so that you may protect yourself and, more importantly, so that we see the NEED to work on solutions going forward. Such solutions cannot be developed by the central bankers who created the systems that are now failing. Solutions cannot be brought to you by people who do not understand the situation and did not see it coming. These experts see wave C coming! ARE YOU READY? Can you see what the future will look like at the bottom of wave C? We have talked about the past, we know the present situation is bad, but many think it’s almost over. The true experts who I have quoted say that isn’t so. What I see at the bottom of wave C is a group of central bankers having meetings all over the world in “emergency” fashion. They will suddenly announce a plan that will be encapsulated on a 1,200 page paper that suddenly appears one evening! That plan will include “a way out,” and it will include more and bigger interest bearing fractional reserve money by fiat, with mega loans to countries in trouble. Thus they will be “saved.” The reality is that they will not be “saved,” they will become imprisoned and controlled by debt – their people and their resources will thus become controlled by the central bank. IT DOESN’T HAVE TO BE THAT WAY! What I also see coming, without PROPER change, are the “events” that tend to follow economic “events.” WE THE PEOPLE don’t want to go there, while others may profit from such upheaval. Are those the same people who bring you the current interest bearing fractional reserve money by fiat system? Are they the same people who own and control the media? THESE ARE SERIOUS QUESTIONS FOR SERIOUS TIMES! Real, lasting solutions are definitely possible. To see them, you must understand where we’ve been, where we are, and where we’re likely headed. Once you do, you will realize that what is being discussed to date is just FLUFF. TREES. The forest is the Math which simply no longer works. The roots can be found in the underlying structure of our political, money, and economic systems. If you understand this, along with the material in my other CUT THE CRAP articles, then you are ready to hear about real solutions. THE TIME TO ACT IS NOW. It is not coming at some point in the future, you are not going to push this math off on your grandchildren, it is here and it is NOW. Failure to ACT will result in those same people bringing you more America of the CORPORATION FOR THE CORPORATION. That is not acceptable to me! Is it acceptable to you? No, that is NOT our future. Our future is one that is BY THE PEOPLE FOR THE PEOPLE. That includes our money, our economy, and our political structure. THE TIME HAS COME FOR ACTION, you will begin to hear my ideas and views regarding solutions soon. I hope you can keep an open mind and take them in the spirit of which they are intended. I do not pretend to have all the answers. I think I know where the roots lie and know that WE THE PEOPLE can TOGETHER come up with answers that will take us forward UP the evolutionary ladder of our economy and of our nation. Haven Trust Bank, Duluth, Georgia, was closed today by the Georgia Department of Banking and Finance, and the Federal Deposit Insurance Corporation (FDIC) was named receiver. As of December 8, 2008, Haven Trust had total assets of $572 million and total deposits of $515 million. BB&T agreed to assume all of the deposits for $112,000. In addition to assuming all of the failed bank's deposits, BB&T will purchase approximately $55 million of the failed bank's assets. The FDIC will retain the remaining assets for later disposition. The FDIC estimates that the cost to the Deposit Insurance Fund will be $200 million. Haven Trust is the 24th bank to fail in the nation this year, and the fifth in Georgia. The last bank to be closed in the state was First Georgia Community Bank, Jackson, GA, on December 5, 2008. Sanderson State Bank, Sanderson, Texas, was closed today by the Texas Department of Banking, and the Federal Deposit Insurance Corporation (FDIC) was named receiver. As of December 3, 2008, Sanderson State Bank had total assets of $37 million and total deposits of $27.9. The FDIC estimates that the cost to the Deposit Insurance Fund will be $12.5 million. Sanderson State Bank is the 25th bank to fail in the nation this year, and the second in Texas. The last bank to be closed in the state was Franklin Bank, SSB, Houston, TX, on November 7, 2008. Well, despite awful fundamental news, the market held tough. This is making the bulls feel more confident that we’ve “reached bottom” and will proceed higher. Whew! I sure am glad the worst is behind us! Ha, ha… the punch line to that joke is that this market is terrific at drawing in fiat money from both sides and returning it to the ether from which it came. Don’t let it destroy yours! For the day, the DOW finished up 63 points (280 points above this morning’s low), the S&P finished up .7%, the NDX was up 2.2%, and the RUT was the leader on the upside with a strong 3.8% showing. Volume on the day was mostly flat relative to yesterday. Advancing issues were about 2.5 to 1 over decliners. 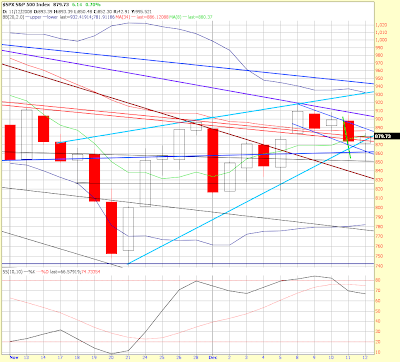 The short term stochastic is approaching over bought but there’s room for either direction on Monday. The VIX closed right on the bottom boundary of its triangle. It keeps threatening to break down, but hasn’t. If it does, I will feel a lot more confident about getting some more upside. Until it does, prove it! One of the potential tape bombs for today was the fact that GGP (General Growth Properties), a very large commercial real estate company, was looking like they were going to miss a debt payment but were able to refinance it at the last second today. That sent REITS up like a rocket, nearly reversing yesterday’s plummet. SRS dropped 19% today to basically undo yesterday’s advance. Ridiculous, CRE is in big trouble in this environment. GGP has gone from being a $65 stock to a buck-eighty – AFTER gaining 25% today. Below is a chart of the SPX daily. 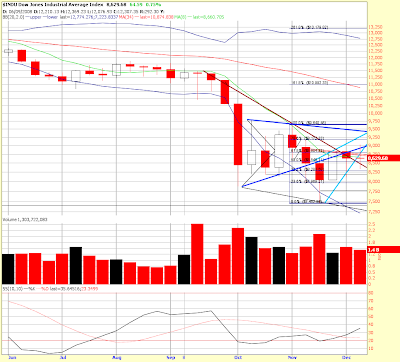 Note that today’s candlestick clearly broke the bear wedge, but clawed its way back inside. This candlestick looks very similar to the one on 11/18. 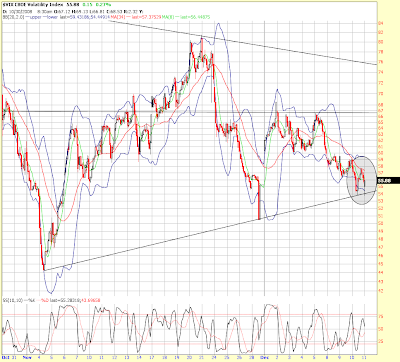 Again, note the sell signal on this stochastic timeframe. 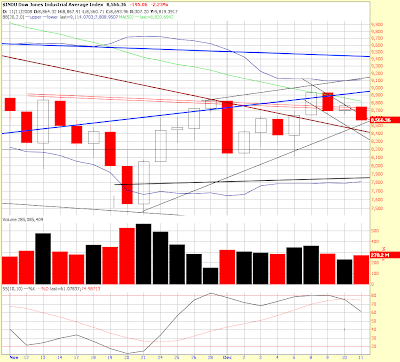 The next chart is the DOW weekly. It has a buy signal on the stochastic illustrating the cross currents I’ve been talking about all week. The weekly candlestick is a spinning top that shows indecision. If you look at the right side of this chart, what do you see? Do you see a bull run? I sure don’t, again, what I see is more of a big flat that looks to be buying time before its next move. 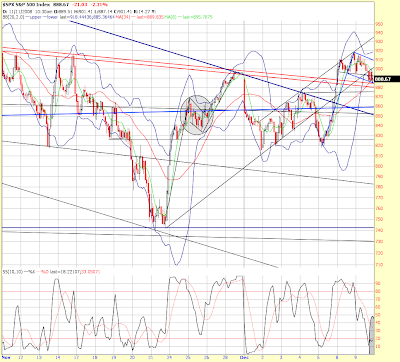 It does still appear that we’re in wave B up/sideways for now, but may have a short term bearish slant. 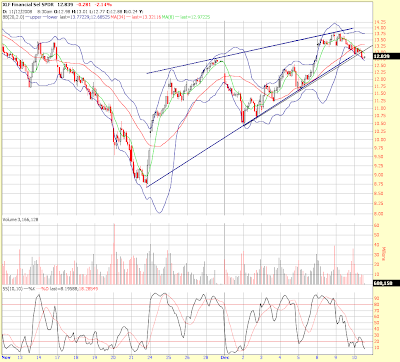 It will be interesting to see if that potential bear flag breaks down, or if we head higher. I have the first Christmas party of the season tonight, I hope everyone has a great weekend and I’ll try to find some interesting posts tomorrow while I work on my next article. Almost reached the earlier 890 target, made it to 883, but markets are having trouble breaking higher here. Looks like a bear flag (green) forming in the short run. If that breaks lower, the target would be about 815ish depending upon if/where it breaks. 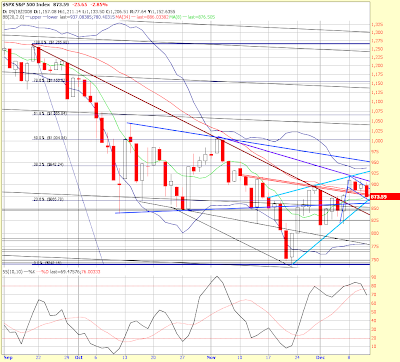 Notice on the chart that it is following the bottom of the bear wedge (light blue up slopping line). We are also still following the inverted H&S neckline. The bullish case is that we made a higher low and we remain in the blue line channel, which itself COULD still be a bullish wedge. Overall still looks like a battle. I give the bears the edge in the short run, but the bulls may win in the intermediate term. Long term, definitely still bearish. Both the daily and weekly candlesticks right now look like spinning tops, this shows indecision. Remember, it’s bank failure Friday… bad news can come out of the blue, thus if you are long, my advice is to be careful. Same goes for being short, it’s a dangerous market in both directions. Cash is always good in times of uncertainty. Dec. 12 (Bloomberg) -- Ecuador won’t make a $30.6 million bond interest payment due Dec. 15, putting the country in default for a second time this decade, President Rafael Correa said. “The country is in default,” Correa told reporters in his office in Guayaquil. He said the government will seek a restructuring with bondholders. By defaulting, Correa, 45, fulfills a threat he made during his 2006 presidential campaign and reiterated throughout the first two years of his term. His decision comes as a deepening global economic slump throttles demand for oil, the country’s biggest export. Ecuador, which defaulted in 1999, owes about $10 billion to bondholders, multilateral lenders and other countries. Looks like we broke up out of that triangle and have now fueled a short covering rally as we are also back inside the wedge boundary. Below is a TOS chart showing an interesting diamond formation on the DOW (/YM), and the S&P (/ES). Note how we entered from below and broke higher. The move higher should mirror the move into it. Diamond formations are EITHER continuation patterns OR reversal patterns. This and the earlier triangle pattern look to be targeting the 890 area. We’ll see, I’m back to being more neutral here as I can still see it both ways. The bullish wave ‘B’ forces are fighting strongly against the realities of the underlying fundamentals. When you step back and look at the bigger picture, we are just moving sideways and have been since October 10th. In fact, we’re in the exact range of that day now. The only real difference, market wise, is that now we have worked off a great deal of the oversold condition that existed then. Meanwhile the bond market has continued to show a flight to safety. Certainly interesting times! 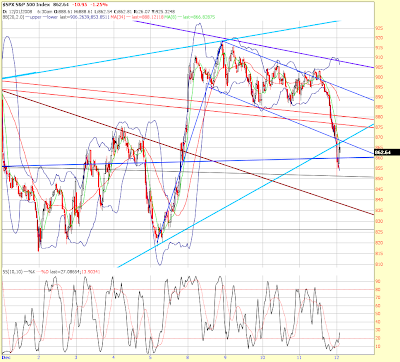 Below is a 5 minute SPX chart. Note the small triangle that has formed. This triangle looks like it was entered from the top, BUT, when you consider what happened overnight it was entered from the bottom. So, this one could break either way. it's good for about 25 SPX points either way. The DOW looks stronger, as does the NDX & RUT. I'm still being careful here, but think that it's bullish if we break up and get back inside that bottom bear wedge boundary (light blue). 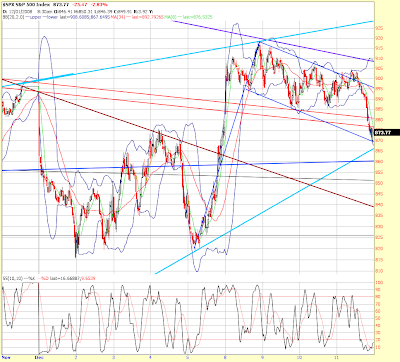 10 minute SPX chart below. 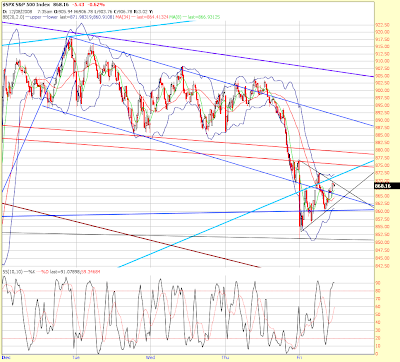 Note that we came back up and “kissed” the light blue bear wedge bottom. 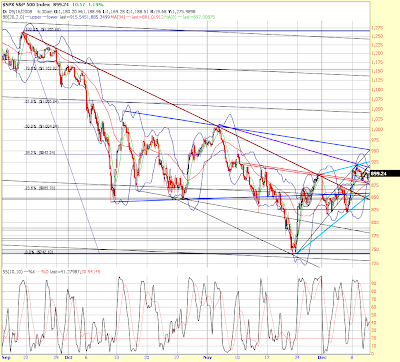 We are also right back at that same old triangle bottom, the dark blue line that is now at the 860 level. That line has acted like a magnet for the past two months. 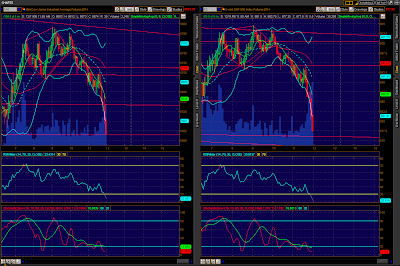 Note the stochastic is coming up out of oversold. 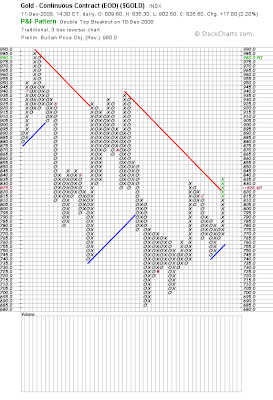 The chart below is the 60 minute SPX. Note the clean break of the wedge. The fast stochastic is oversold, but the slow is still pointing down. The 860 level is also the 61.8% retrace line of the ‘a’ move up, and so far we have thrown a pin through it, but it is holding so far. Interesting action, still a lot of crosscurrents but I think the sell signal on the daily charts will prevail for a short while. DOW futures are down 250 points this morning after hitting 8,200 last night and then bouncing. The SPX hit the 830 area and is now about 843. This deal with Madoff is potentially very bad. Hedge funds are already squealing, I can see this leading to more liquidation and deleveraging. Producer Prices fell 2.2% in November, more than forecast. A lot of that is fuel costs, but it is reflecting the deflationary forces at work. Retail sales fell for the fifth straight month, down 1.8% in November from October. Remember, November is the start of the holiday shopping season – that’s very weak. And, of course, we can’t forget about the crisis du jour, the automakers… Let’s not forget that the government just gave them $25 billion not too long ago. That was a mistake, and “lending” them another $15 billion or letting them turn themselves into banks and exchanging bad loans for good money simply would not have been good for America. The question now is will the current Administration jump in and just give them the money? Regardless, it’s going to be painful and a tough road ahead, just as it would have been regardless. NOW, IF WE CAN ONLY STOP THE INSANITY WITH THE BANKS! Let’s look at the 20 minute SPX below. You can see that we clearly broke the bear wedge and the descent last night stopped at 830, thus NOT breaking the 12/5 low… so if we bounce from here we will have produced a higher low which is bullish, but we’ll see. 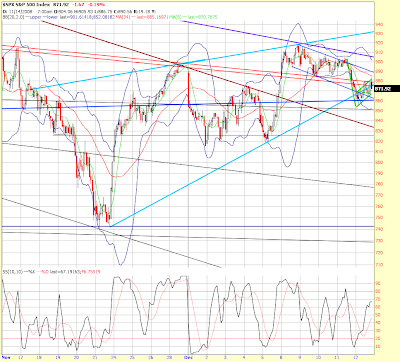 So far it has bounced back up on top of the red down sloping line from September. The stochastic is pretty deeply oversold at this level. And let’s not forget that ominous triangle on the VIX, today’s action will plant us further back up into it – scary bearish if that triangle eventually breaks higher. I did go short yesterday afternoon, I took half profits at the close yesterday and may take some more here, but will be looking at the short side some more, especially if we come back up and “kiss” that blue bear wedge line. Either way, I still think it’s a time to be careful here. Yesterday was the Thursday before options expiration which is next Friday. The rule of alternation (about 70% reliable) says that when Thursday is down, the week of options expiration is up. Fresh sell signals on all the major indices daily stochastic, fresh buys on the weekly… still cross currents. Little bit of a bounce going on, the DOW is now down 215, the S&P is at 850. This is HUGE news. We're talking about a guy who was a very big Market Maker. There is potentially more than $30 billion unaccounted for here THAT COULD COME OUT OF THE STOCK MARKET. Beware, this is a potential tape bomb, and certainly will not instill confidence in the markets. Dec. 12 (Bloomberg) -- Bernard Madoff had confessed to employees this week that his investment advisory business was “a giant Ponzi scheme” that cost clients $50 billion before two FBI agents showed up yesterday morning at his Manhattan apartment. “We’re here to find out if there’s an innocent explanation,” Agent Theodore Cacioppi told Madoff, 70, who is considered a pioneer of modern Wall Street. “There is no innocent explanation,” Madoff told the agents, saying he personally traded and lost money for institutional clients. He said he “paid investors with money that wasn’t there” and expected to go to jail. With that, agents arrested Madoff, according to an FBI complaint. The 8:30 a.m. arrest capped the stunningly swift downfall of Madoff and businesses bearing his name that specialized in trading securities, making markets and advising wealthy clients. Many questions remain unanswered, including whether Madoff’s clients actually lost $50 billion. The complaint and a civil lawsuit by regulators describe a man spinning out of control. Madoff, a white-haired man, appeared in federal court in downtown Manhattan at 6 p.m., wearing a white-striped shirt and dark-colored pants. U.S. Magistrate Judge Douglas Eaton described the securities-fraud charge against him and set a $10 million bond at a hearing where Madoff said nothing. Madoff later posted the bond, secured by his apartment and guaranteed by his wife. Madoff’s firm had about $17.1 billion in assets under management as of Nov. 17, according to NASD records. At least 50 percent of its clients were hedge funds, and others included banks and wealthy individuals, according to the records. The firm was the 23rd-largest market maker on Nasdaq in October, handling an average of about 50 million shares a day, exchange data show. It handled orders from online brokers for some of the largest U.S. companies, including General Electric Co. and Citigroup Inc. Prosecutors are joining regulators at the Securities and Exchange Commission, which filed a civil lawsuit, in scrambling to unravel the collapse of Bernard L. Madoff Investment Securities LLC. The broker-dealer and investment adviser was housed in a lipstick-shaped building at 885 Third Ave.
A rapid series of events in early December preceded the firm’s demise, according to the arrest complaint and SEC lawsuit. In the first week of December, Madoff told a worker identified as Senior Employee No. 2 that clients had requested $7 billion in redemptions, he was struggling to find liquidity, and he thought he could do so, according to the FBI and SEC. Senior employees “previously understood” that the investment advisory business managed between $8 billion and $15 billion in assets, according to the documents. On Dec. 9, Madoff told a colleague identified as Senior Employee No. 1 that he wanted to pay bonuses in December, or two months earlier than usual. The next day, Madoff got a visit at his offices from the employees. They said he appeared “under great stress” in prior weeks, according to the documents. Madoff told his visitors that “he had recently made profits through business operations, and that now was a good time to distribute it,” according to the FBI complaint. When the workers challenged that explanation, Madoff said he “wasn’t sure he would be able to hold it together” at the office and preferred to meet at his apartment, Senior Employee No. 2 told investigators. At Madoff’s apartment, he told the employees that his investment advisory business was a “fraud” and he was “finished,” according to the FBI complaint. He said he had “absolutely nothing,” that “it’s all just one big lie,” and that it was “basically, a giant Ponzi scheme,” Agent Cacioppi wrote in the complaint. The senior employees understood Madoff to be saying he had paid investors for years out of principal from other investors, the agent wrote. The business had been insolvent for years, said Madoff, who then made a stunning disclosure -- he estimated losses at more than $50 billion. Madoff said he had $200 million to $300 million left, and he planned to pay employees, family, and friends. Madoff, who had also confessed to a third senior employee, said he planned to surrender to authorities within a week, according to the complaint. Cacioppi and another agent beat Madoff to the punch. After saying he had no “innocent explanation,” Madoff confessed “it was all his fault,” Cacioppi wrote. Madoff founded the firm in 1960 after leaving law school, according to the company’s Web site. His brother, Peter, joined the firm in 1970 after graduating from law school, it said. Bernard Madoff was influential with the Nasdaq Stock Market, serving as chairman of the board of directors, according to the FBI complaint. He was chief of the Securities Industry Association’s trading committee in the 1990s and earlier this decade. He represented brokerages in talks with regulators about new stock- market rules as electronic-trading systems and networks grew. He was an early advocate for electronic trading, joining roundtable discussions with SEC regulators considering trading stocks in penny increments. His firm was among the first to make markets in New York Stock Exchange listed stocks outside of the Big Board, relying instead on Nasdaq. Madoff’s Web site advertises the “high ethical standards” of his firm. The case is U.S. v. Madoff, 08-MAG-02735, U.S. District Court for the Southern District of New York (Manhattan). Unfortunately doing the right thing is sometimes hard. We have bankruptcy procedures for a reason. The problems with the automakers can be traced all the way back to the original Chrysler bailout. Had they been allowed to fail, had the markets been allowed to correct fully without stimulus, stimulus, and still more stimulus, then we would not be where we are today. Dec. 11 (Bloomberg) -- The Senate rejected a $14 billion bailout plan for U.S. automakers, in effect ending congressional efforts to aid General Motors Corp. and Chrysler LLC, which may run out of cash early next year. The Bush administration will “evaluate our options in light of the breakdown in Congress,” spokesman Tony Fratto said. The Senate thwarted the bailout plan when a bid to cut off debate on the bill the House passed yesterday fell short of the required 60 votes. The vote on ending the debate was 52 in favor, 35 against. Earlier, negotiations on an alternate bailout plan failed. “Remember when the first financial bailout bill failed” in Congress in late September, said Martin Marnick, head of equity trading at Helmsman Global Trading Ltd. in Hong Kong. “The markets in Asia started the slide. Deja vu, this looks like it’s happening again.” Congress approved a financial-rescue plan weeks later. Senator George Voinovich, an Ohio Republican, urged the Bush administration to save the automakers by tapping the $700 billion bailout fund approved earlier this year for the financial industry. “If this is the end, then I think they have to step in and do it -- it’s needed even though they don’t want to do it,” Voinovich said. Hate to say it, but our false financial industry was way, way too big. False profits, false financial industry, false economy coming home to roost. Dec. 11 (Bloomberg) -- Bank of America Corp., the third- largest U.S. bank, said it plans to cut 30,000 to 35,000 positions over the next three years because of its acquisition of Merrill Lynch & Co. and the weak economic environment. The final number of job cuts won’t be decided until early next year, the Charlotte, North Carolina-based company said in a statement today. The takeover of the New York-based investment bank is expected to be completed later this month. The cuts will occur throughout the companies, affecting all lines of businesses and staff units, Bank of America said. “As many reductions as possible will be made through attrition,” the lender said. More conversations with Hugh Hendry. Telling the truth – I like that and I like him. A relatively exciting day, finally got a clean directional move that I caught on the short side for a fair profit. The DOW finished the day down 196 points, the S&P down 2.9%, the NDX lost 3.5%, and the RUT lead again with a 5.3% loss. I’m not going to try to justify the selling, other to say there was a treasury auction that didn’t go so well and Jamie Dimon (JPM CEO & N.Y. Fed member) made some negative comments about financials which were also killed, the XLF gave up 7.7%! Internals were negative by about 4 to 1. REITS got slammed. IYR lost 14.4%, giving SRS a rocket ride up 25% on the day! The transports also got killed, the index lost 192 points, nearly as much as the DOW! That’s a feat when your index is only at 3,200 points. They gave up 5.6% today. 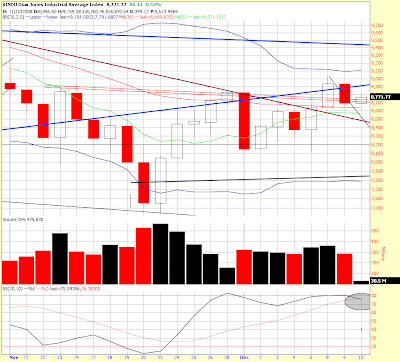 Below is a chart of the DOW daily, note the increasing volume and the clear sell signal on the stochastic. Also note that it is being squeezed between the black uptrend line and the green 50 day average that is down sloping. Looks like a resolution one way or the other has to come pretty soon. 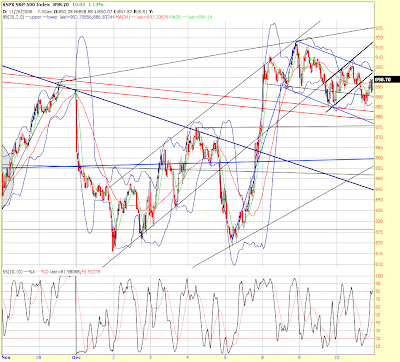 Next chart is the SPX 10 minute. 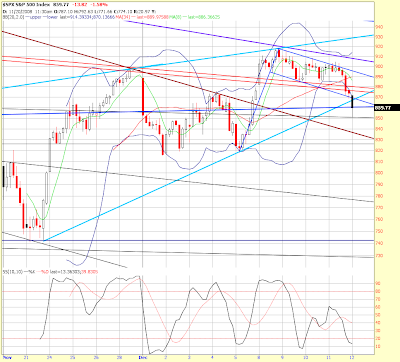 Note the light blue lines which make a potential bearish wedge. It held. Now look at the darker blue flag channel… we hit 870 perfectly and bounced right at the close. That’s a potential springboard for tomorrow if prices want to gravitate back to the top of that channel. 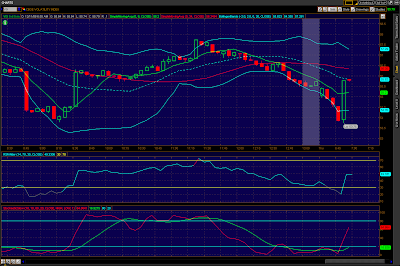 Note the fresh buy signal from oversold on this 10 minute timeframe on the stochastic. The 20 minute and 60 minute fast are also oversold (slows are not), which may indicate higher prices tomorrow, thus I took profits into the close today from my short positions. Look at the congestion/support between 870 and 830… there’s a lot there. I wouldn’t get heavily short again until we clear the 850 area (today’s close may have been a good long entry point, but not for me). 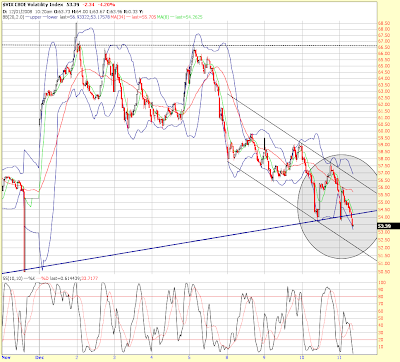 The last chart is the VIX, 5 minute close up. It returned to its triangle which is not bullish, but it did diverge in the fact that it was barely positive on a fairly large down move in equities. Once again I’m cautious here. I liked today and did well. For me to get long, the VIX would have to exit that triangle and stay out. The fundamentals certainly don’t support that move, as those who do not have a job could attest. The DOW and SPX are hovering right around even and are at the top of their respective potential bull flag channels, but the DOW is sneaking up and out. The TNX is rising again and thus the setup looks bullish, but again, I’m not sure the impetus is there to break significantly higher. We’ll see, still in the range and thus not betting one way or the other. 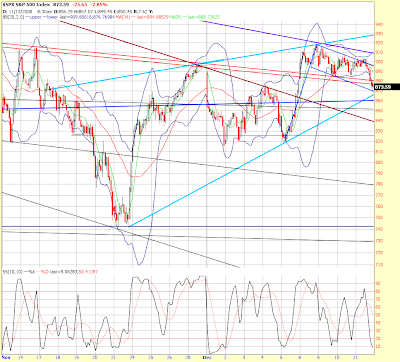 I note that the SPX stochastic is very close to issuing a sell signal on the Daily. Also, the transports are negative with their sell signal widening. The XLF is down 2% with a daily sell signal that’s widening. Somebody’s going to get hurt, it’s not going to be me! The DOW is currently down 52 as the indices fill the gap from this morning’s open. The action on the VIX was interesting this morning. It came down while the market was down on the open – that is a divergence. It tested the bottom boundary of that triangle again and JUMPED off of it. The TOS charts are incorrect and not posting correct VIX information. This makes pattern work difficult. The Prophet charts are better, here’s a 20 day view of the VIX and you can see this morning’s action in the circle. I just can’t see going long unless that bottom boundary breaks. It hasn’t, I’m watching it – closely. DOW futures are down 160 points this morning. The fundamentals of our economy continue to deteriorate. The only exception in the news this morning is that foreclosures in November actually dropped slightly. I believe that will prove to be temporary. People filing for first time unemployment for last week rose much greater than expected, by 58,000, jumping to 573,000, a 26 year high. The trade deficit for October was expected to narrow, instead it widened to $57.2 billion. Yes, our imports are falling dramatically, but so are our exports. That means that despite the world-wide slowdown we still need $2 billion a day in foreign money to finance this deficit. Cheney and others say that these deficits don’t matter. They are WRONG. They are sacrificing BOTH security and freedom with their incorrect ideology. The House passed the $15 billion bridge loan for Chrysler and GM. The terms were too onerous for Ford, so they passed. Now it goes to the Senate where there is opposition. Many are hailing this as positive because of the restrictions being placed on them. Not me, the very fact it is even being discussed is against all the principles this country was founded upon. And those who think that Ford is looking great by taking a pass had better take a look at the airline industry. Having your competitors in bankruptcy or getting any kind of special treatment gives them an advantage. Those zombie businesses use their bankruptcies to unload debts off their creditors while slashing wages and benefits thus allowing them to compete with lower prices. Those who choose to avoid bankruptcy are left with legacy wages, etc. The entire thing is a mess, we never should even be discussing interfering in the way we are. The only thing that needs tampering with in this regard is the broken bankruptcy laws that have been written and put in place by corporate America for corporate America. The Russians are talking further about devaluing the Ruble. Rumor has it the Chinese are talking along the same lines. These types of currency manipulations will impact global markets, so we need to be aware and consider their impact. I’ll have more on this as I know more. The bond market continues to say deflationary credit collapse. Short term yields are still basically zero. The charts of the 10 year and of the long bond are looking suspiciously like they are ready to move even deeper into lower yields. The chart of the TNX, for example, looks to be making a wave 4 sideways consolidation at about 2.5%, and if there is a wave 5 coming it looks to be targeting 2%. That is unbelievably low for a 10 year note. 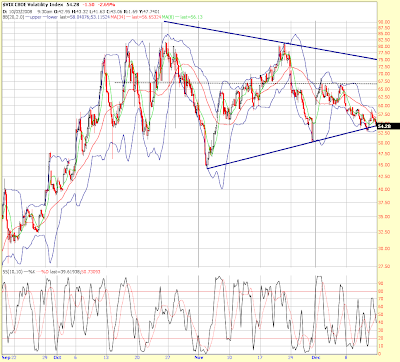 The TNX just broke down out of a small triangle this morning. The VIX remains in its ominous triangle for now, not good if you are long equities. Same technical picture as discussed in yesterday’s end of day report. I do note that I am starting to see some small bearish divergences and a volume pattern that is not looking too bullish either. The 885 level on the /ES or SPX seems to be providing support for now, I don’t plan on any sizable plays in here unless we can break out of this range in one direction or the other. 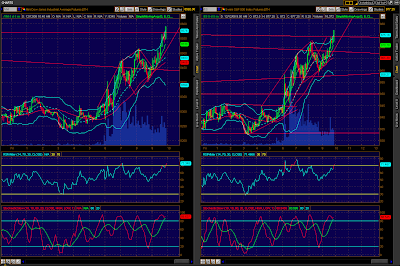 Again, I point to what looks like fresh sell signals on the DAILY charts, the DOW and Transports showing them first. 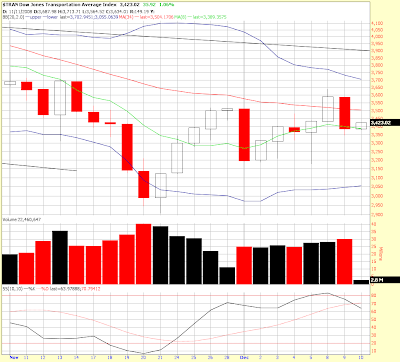 Still on the WEEKLY buys signals, which means that there may be more rally after a period of decline. Cross currents, and they are difficult to play. The patient person will wait for alignment as I spelled out in my article on the subject. I have a couple more articles in the pipeline, look for one either later today or tomorrow. I’m making so many update posts that it seems the articles are getting lost in the noise, so I’m working on ways to get them to stand out. One thought I have is that I may produce a second blog, one that is dedicated to my articles and one that is dedicated to technical work and market updates. Let me know your thoughts for improvement. Also, I am discovering that the automatic email summary is not working that well. It’s not sending them at the time I have in their system and they are hard to read. I increased the font size and played with the timing feature so we’ll see how that goes. For my friends I am going to start a twice daily “executive summary” via email. No guarantee on how long I can keep that going. My list is growing and it takes a lot of time to manage. The DOW futures are down 150 points just prior to the bell. The DOW finished the day up 70 points, the S&P added 1.2%, the NDX was up .8%, and the RUT lead the way up with a plus 2.3% showing. The XLF finished down 1%, and the VIX held above the triangle bottom closing down 5.4% at the 56 level. The fundamental picture has no change that I can see. The IRX is still basically zero as the Treasury is able to sell debt without interest – zero, nada. Sorry, but that means that money is scared and is willing to take safety over returns. It’s still about the return OF capital, not ON capital. Market internals were positive, advancers were about 2 to 1 over decliners, volume was almost yesterday’s equal and most of the indices produced spinning top candlesticks which indicate indecision. Let’s take a look at the 5 minute SPX chart. There’s a lot happening there, again, you can see the blue flag and the channel that we’ve been in for the past three days now. The double red lines is the inverted H&S neckline, note that we have not been able to make progress one way or the other from there, but we do remain on the bullish side. You can see the smaller bear flag in black that broke down, but produced another flag within the channel. Lower highs, but a possible double bottom with equal lows was last made just above 885. Now let’s zoom out to the 60 day, 60 minute SPX chart. There’s a lot happening here since late September. The rust colored downtrend line was just broken a few days ago – bullish. Then the double red lines confirmed the inverted H&S – bullish. The blue flag at the far right and seen on the 5 minute chart above is again bullish – the traditional target on that would be about 985 at this point, but again there needs to be impetus for that and it hasn’t come as of yet (symmetrical target is 940/950 which is coincidental w/38.2% fib). You can see the old big blue triangle is still there, the bottom of which is now about 858. Note that since October 10th, the deviations from that line have been getting smaller. 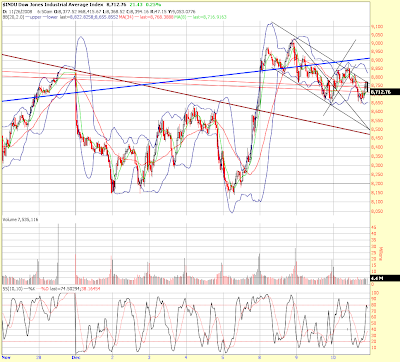 The light blue lines I just drew in is a potentially bearish wedge. And if that weren’t enough, I drew in a lovely lavender line from the 11/4 high that when combined with the lower light blue line make a potential triangle which, being on the end of a big downtrend, you would normally expect to break down. As you can see, there’s a reason for my non-committal in the short term – it’s justified! Now, give me a break above the lavender line or below the lower light blue line and I’ll pick a direction. Until then, small or not at all. What tool do we have to break a tie? Well, Elliott Wave would be one – if we knew the count for sure. EW doesn’t forecast the future though, it only eliminates possibilities for us if the rules of construction are broken. Right now there is definitely more than one possibility, but the consensus seems to be that we finished all five waves of A down and have entered B up/sideway. That would argue the bullish case short term if true. The problem with EW is that we won’t know for sure until after the fact. So, basically what I’m saying here is that it’s probably a good time to go on vacation like a normal person! PS - watch the VIX! Cross currents, channels inside of channels… triangles that end in wedges, oh my! As you can see from the 10 minute SPX chart below, we are in that same blue channel, but the time relationship with wave ‘a’ is now definitely gone. You can see that we produced a smaller bearish channel within that larger channel and are swinging up and down, but making lower highs. It looks to me like the short term stochastic is going to finish in middle ground, but possibly overbought on the 10 minute timescale and closer to oversold on the 60 minute time scale. Right now the DOW is up only 30 points. If it closes here it will have “wound the spring” which may produce a small movement on the McClelland Oscillator and may result in a large movement in the next couple of days – but that does not tell us direction. This next chart is the DOW 10 minute. Same channels, the smaller one inside the larger is bearish and is targeting about the 8,450 area which coincides with that fat rusty red line. 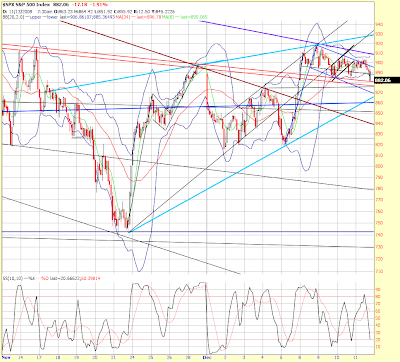 But then again, the larger channel is bullish looking and would take us considerably higher. Place ‘yer bets! Wish I could be more helpful, all I can say here is I’m keeping it small or not at all. Cross currents and chop. 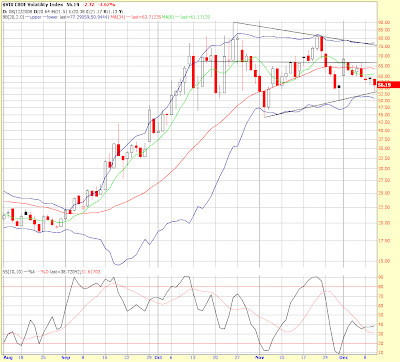 I think that VIX chart looks ominous, though, unless it breaks beneath the bottom of that triangle. This morning’s rally did not impulse through overhead resistance. It needed to in order to keep the symmetrical time relationship in tact. The impetus to create that wave just wasn’t there - so far. Note the obvious triangle. This morning the VIX dropped dramatically, hit that triangle bottom and launched back up as the markets just broke back down off their highs. 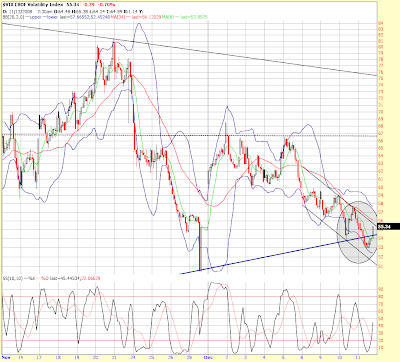 Should the VIX be taking a trip back to the top of this triangle, that is very BEARISH, not bullish. Thus, I think caution is advised. For a rally to be sustainable the VIX needs to come down and break this lower boundary. Should the VIX go back up to the top of this triangle and break in the upwards direction, you will NOT want to be owning stocks, as the target for that triangle is way, way up there (like 120 plus). So, with that bounce off that VIX bottom, I decided to take a small gain on a very short term trade and not be a pig. I will be a whole lot more bullish if the bottom of that triangle gets broken. That would be a wrong-way break, by the way, as triangles usually break in the same direction they are entered. When they do break the wrong way, however, the move tends to be quick and violent. While the market went higher, the XLF (financials) moved lower this morning. 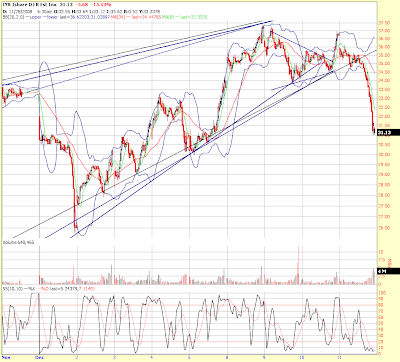 Below is a 30 minute chart. 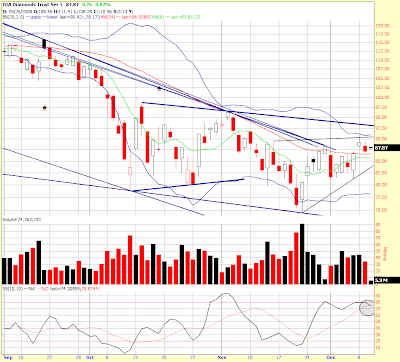 You can see a clear wedge that looks to be bearish. 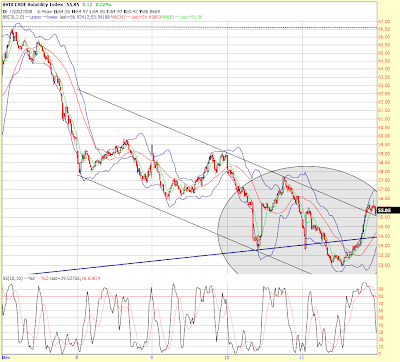 That said, note that the stochastic in this time frame is oversold, so some bounce on that is expected. Something to watch, the market will have a hard time moving higher with action like that. It looks like we got the gap fill and we almost hit 890, bouncing off of 892. I took a small long position at 895, this is a one or two day play at most. I think we need some kind of positive impetus to break higher and that may or may not come. So, people reading my blog seem to be unclear where I stand in the medium/short term. I have repeatedly said “Cross currents,” and that I think it's a mixed picture at this time. My best guess is that I do think we have entered wave ‘B’ up/sideways which is the eye of the hurricane. We experienced wave A down, now wave B up/sideways, then comes wave C down. Wave C is the destructive wave. It’s the one that will usher in real change. That’s why I’m writing my “Cut the Crap” article series, to plant the seeds for positive change at the bottom of wave C. What I see happening is that the central bankers will come in and DICTATE to us how the new and “improved” system will work! I say, NO. We, the people, need to come up with something better and tell the central bankers how it’s going to be! Brash, I know, but I do not want a world run by them, and neither will you. 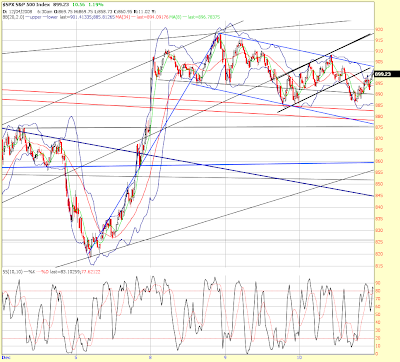 Now, in the short term I see that we are in wave A up of an A-B-C move that will make up the larger wave B up/sideways. Within that wave A up, there is a smaller a-b-c and we are making wave ‘c’ now which I believe will reach about the 940/950 area within the next couple of days. I make that time frame estimate based on the length of wave ‘a’. That a-b-c will make up the larger wave A, then we start on wave B down. But, after wave B down, then we have wave C up that should take us into the 1,000 plus range on the S&P. That’s what I’m thinking right now. Of course, anything could happen and we could just head right on down here. I don’t think so, but I don’t eliminate that as a possibility and thus I am playing small. Does that make it clear? So, cross currents are what I see. Very short term up (next couple of days), then a correction, then more up for the medium term, then more, much more down in the longer term. Hope that helps make it clear.